(Nanowerk News) Computer chips that transmit data with light instead of electricity consume much less power than conventional chips, but so far, they’ve remained laboratory curiosities. 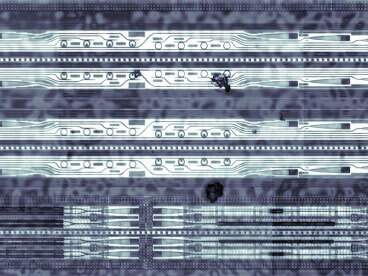 Professors Vladimir Stojanovic and Rajeev Ram and their colleagues in MIT’s Research Laboratory of Electronics and Microsystems Technology Laboratory hope to change that, by designing optical chips that can be built using ordinary chip-manufacturing processes. Granted access to the same manufacturing facilities that Texas Instruments uses to produce cell phone chips and microprocessors, the MIT researchers have demonstrated that they can put large numbers of working optical components and electronics on the same chip. But so far, the electronics haven’t been able to control the optics directly. That’s something that Stojanovic hopes to show with a new batch of chips due back from TI and another major semiconductor manufacturer this winter. Optical chips use structures called waveguides to direct light, and researchers trying to add optical components to a silicon chip usually carve the waveguides out of a single crystal of silicon, Stojanovic says. But waveguides made from single-crystal silicon require insulating layers above and below them, which standard chip-manufacturing processes like TI’s and Intel’s provide no way to deposit. They do, however, provide a way to deposit insulators above and below layers of polysilicon, which consists of tiny, distinct crystals of silicon clumped together and is typically used in the part of a transistor called the gate. So the MIT researchers built their waveguides from polysilicon instead. To meet the bandwidth demands of next-generation chips, however, the waveguides will have to carry 128 different wavelengths of light, each encoded with its own data. So at the receiving end, the ring resonators provide a bank of filters to disentangle the incoming signals. On the prototype chips, the performance of the filter banks was “the most amazing result to us,” Stojanovic says, “which kind of said that, okay, there’s still hope, and we should keep doing this.” The wavelength of light that the resonators filter is determined by the size of their rings, and no one — at either TI or MIT — could be sure that conventional manufacturing processes were precise enough to handle such tiny variations.